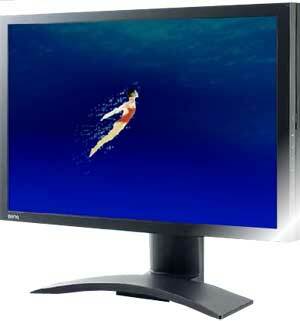 The BenQ FP241WZ 24" LCD Monitor is a hybrid combining the VGA and DVI inputs and 16x10 (WUXGA, 1920 x 1200 native resolution) format from the computer universe with HDMI, Component, and S-Video inputs and 1080p resolution from the HDTV world. The melding provides a crossover product that is as comfortable surfing the web and compositing in Photoshop as it is watching an HD movie or battling in Gears of War. 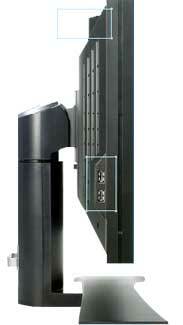 Granted, when I think about HDTVs, my mind's eye envisions a 40" (or larger) beauty mounted on my home theater wall. If I'm deep in reverie, then the high definition dream floating in my fantasy is an HDTV that is my home theater wall. On my return to reality, I realize that HDTVs come in all different sizes. The BenQ at 24" services an office/dorm room/bedroom/kitchen niche where one monitor for both the TV and computer is a great space saving solution. Now, I need to be careful using the term HDTV when describing this BenQ monitor because it does not have a TV tuner, neither NTSC nor ATSC. So if you want to watch TV on this unit, you need to plug it into a set top box or use a portable TV tuner like the Hauppauge WinTV HVR950. If you do feed a high definition television signal into it, the BenQ will display it in full resolution. Also, the FP241WZ does not sport any speakers - not even those tinny ones that are so common in computer monitors. To be properly geared for every viewing possibility, you will need to supplement your setup with speakers. A dedicated audio system would be ideal, especially if you don't have a great audio card in your computer. I keep thinking of the FP241WZ as a computer monitor, partly because I am composing this review on it. But, I definitely appreciate the fact that it's also a high definition TV monitor. If it weren't, I wouldn't be reviewing it at all. In fact, when hooked up to the Toshiba HD-A20 HD-DVD player, the BenQ acquitted itself quite well as a 1080p HDTV. I just think it would be a shame not to dual purpose it. In the FP241WZ box, the screen is disconnected from the stand. Assembly is a straightforward one-step process. Once attached, you find that the screen slides up and down on the stand, locking in at about 4 ½" above the bottom of the stand and raising up to about 9 ½". At the top height, you have room to rotate the display to the vertical, portrait orientation. The screen also swivels 45 degrees left or right and 5 degrees forward and 20 back. 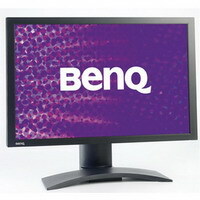 The black bezel is standard issue, but at 24" diagonally, this BenQ stretches our early 21st Century concept of a computer monitor. We realize that 27 and 30" behemoths are available, but I found that I was leaning back in my desk chair when watching DVDs on this 24" model on my desktop. At this size, you even may wish to mount it on the wall over your desk. The On/Off button along with those for accessing the On Screen Display (OSD) menu are located on the right edge of the bezel. Revealing its computer heritage, the FP241WZ does not come with a remote control, nor is there one available. Unless you are a deft accordion player, finding and pushing the proper sequence of buttons needed to adjust picture settings requires practice and dexterity. For example, to tweak the color, you push the Menu button (fourth from the top, not counting the On/Off) to display the On Screen Menu. Then the Down Arrow (third from the top) to get to the Picture Menu. Then Enter (top button) to enter the Picture Menu. Then Up one to shortcut to the Color control. Then Enter to open the Color menu. Then a series of Enters and Ups and Downs and Menu/Exits to fine tune the color. With a remote in your hand, the process is tedious, but at least you also don't have to keep craning your neck to find the right button. With that minor peeve off my chest - I feel much better, thank you - I will admit that plugging in cables was almost a delight. Made so because you can easily access the connection panel, which is hidden away on the back bottom, by lifting the screen and rotating it 90 degrees. The connection panel is not full of multiple inputs, but it does provide one of all the usual suspects. DVI-D, HDMI, VGA, Component, Composite, and S-Video. Again, be aware, that this unit does not handle audio, even as a pass through. And though there is an HDMI connection, the monitor is only reading the video portion of the signal. If you look closely at the connection panel, you will notice a USB connector on the right of the panel. With the included cable, you can connect to a USB port on your computer and then the monitor's three USB connections will be functional, allowing you to plug in items like card readers or keyboards. Those Feng Shui folks among us will approve of the cable restraint on the stand that makes some effort at assisting you in controlling cable sprawl. 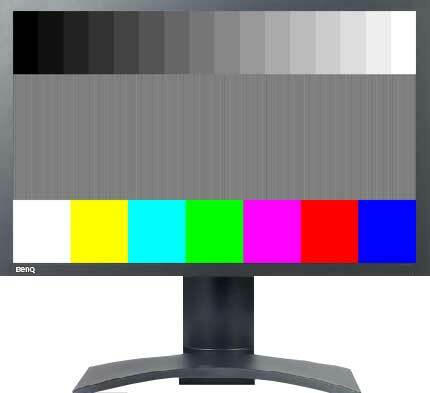 Since the FP241WZ wears two hats, computer monitor and HDTV, I soon discovered that calibrating this BenQ presented a dual headed challenge. With my setup at least, I found that the Brightness setting was completely different when I was watching a DVD playing on my computer's DVD player then when I hooked up the Toshiba HD-A20 HD-DVD player. Let's start with the computer setup, I have a Dell Dimension 520 running Vista with a NVidia GeForce 7300 LE video card. If you hook to the monitor with a VGA cable, the BenQ has a nifty feature called i key, which you activate with a button on the side of the monitor. They suggest displaying the test pattern they provide and then pressing the i key. The monitor looks at the pattern and adjusts timing. Again, the i key only works on VGA signals. Even after i keying, you still must adjust picture quality settings (Brightness, Contrast, etc.) through the OSD. I found that Brightness had to be ratcheted down to about 15 (out of 100). As usual I tested settings on the Digital Video Essentials DVD, (the SD version) playing on the computer‘s DVD player. But since I was in the Windows domain, I also ran through the Windows Media Center monitor setup. Both methods confirmed that Brightness had to be set to 15. Now, I also tried attaching the monitor with the DVI-D cable, which the BenQ manual suggests over VGA. The results were almost exactly the same. The tricky bit about reporting my findings is that there is one major factor in this equation that is difficult for me to dissect out of the discussion. If you think about it, your computer's video card is the wild card in this video poker game, since it is what is dealing the signal to the monitor. I can only imagine that your mileage definitely may vary depending on your card. Now, if you are following my video signal logic, then you won't be surprised that adjusting for an HDMI feed from the Toshiba HD-DVD player entailed more than a few minor tweaks from the computer VGA/DVI-D settings. The video card is out of the deck, but the Toshiba is performing its own brand of video processing before it is dealing the signal to the BenQ. So much so, that I couldn't raise the Brightness high enough to prevent the darkest grays from crushing to black. With the Toshiba hooked to the BenQ with an HDMI cable, even with Brightness at 100, the test patterns were demanding more. I could get back into range, Brightness at about 90, by switching to Component cables. My other option with the equipment that we have currently was using the OPPO DV981HD DVD player because I can go into its setup menu and raise Brightness. When I pushed Brightness up a few notches in the OPPO, I was able to discern the darkest grays from deep black in the test patterns. This allowed me to use the HDMI cable, though of course, I was not able to play HD-DVDs on the OPPO. No matter how idiosyncratic calibrations can be, the bottom line for me is picture quality. As far as the computer setup, the SD version of The Return of the King looked very good - not BeoVision 7-40 great - but upscaled to 1920 x 1080, sitting 2 ½" eyeball to Arwen away, very respectable. At close range, perhaps a bit noisy, but importantly, I could adjust the monitor for a satisfactory viewing experience. Finagling with the Toshiba HD-DVD to BenQ HDMI connection took a bit more tweaking and the result, though dissimilar, had its own appeal. Luckily, I like the richness that can result from a slightly dark picture setting. But I will admit, I wanted to be able to peer into the more shadowy corners in Casablanca. And I kept itching to tone down the overly luxuriant reds in the HD version of The Phantom of the Opera, which has replaced King Kong as our benchmark HD-DVD. The best performance from this BenQ/Toshiba combination was with the Component cables. I was able to dial in brightness so I could enjoy the details of the costumes even in the shadows. Is it Home Theater quality video? I don't think the picture performance will satisfy the highly discriminating videophile, but at 24", I doubt that they are the target audience for the FP241WZ. Once again, the VGA out of the Xbox was a little funky. When I set it to 1920 x 1080, the BenQ would offset the image at least 300 pixels to the left. No amount of adjustments with the Horizontal Position on the monitor would bring the image back to center. I found if I changed the Xbox's Reference Level to Standard, the offset goes away and the Xbox Display Mode still reads 1920 x 1080. But in the Information box on the BenQ, the numbers have changed to 1680 x 1050 at 60 HZ. Practically, I really can't discern any visual difference, since the BenQ is still displaying a full resolution image. I say full resolution because the native resolution of the monitor is 1920 x 1200 and it will upscale any input to that if you have its Display Mode set to Full. If you do, then a 1920 x 1080 signal will be stretched slightly vertically. But if you switch the Display Mode to Aspect, then thin black bars will appear at the top and bottom of the screen as the image is letterboxed to its proper aspect ratio of 16 x 9. The monitor also has a 1 x 1 Display Mode option. One last point, for those Picture in Picture (PIP) fans that I know are out there, the FP241WZ does offer a PIP, which I consider limited because of the input combinations available. Basically, BenQ lets you choose one video source from Column 1 and the other from Column 2. The problem is Column 2 only has Composite and S-Video, so one of them has to be part of the PIP duo. Column 1 contains all the best sources, HDMI, Component, DVI-D and VGA, but you can only pick one of them to pair with your Column 2 option. 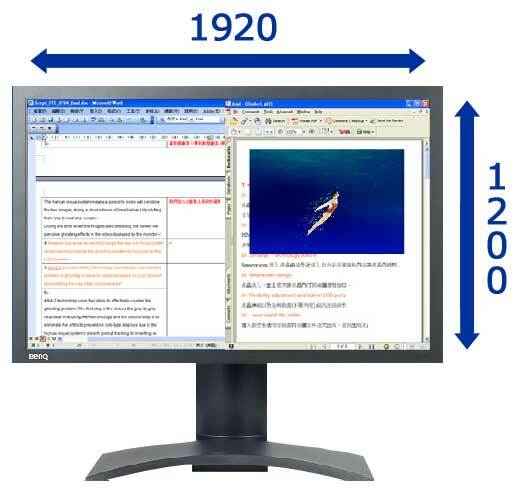 Since we are just beginning to see big widescreen computer monitors crossing over into the 1080p HDTV realm, the FP241WZ is a good initial effort. Still it proves to be a better computer monitor than an HDTV, but then again, it is one fine 24" computer monitor. And only the most judgmental, would turn their nose up on its HD performance. As a user friendly TV, I would still prefer to have a remote control and perhaps an integrated speaker system. Second, we have given only a few 5 Star ratings, which we reserve for truly outstanding accomplishment. As a computer monitor, I would consider giving the FP241WZ a 5. But this is HDTV Solutions and as an HDTV, I have enough issues to rate it 4. Again, I realize that as a computer monitor, BenQ has included most of the features that you would expect. But any self-respecting TV would at least have a remote and a better pipeline for audio. Calibrating the monitor can be a tribulation. Though hooking up and maneuvering this 23 pound unit was a breeze. After all the 4's I have given the FP241WZ, you may wonder how I can come up with a 4.5. The answer is simple. I can no longer ignore the high quality of the computer monitor half of this hybrid. Taken as a whole, I feel comfortable with a 4.5.